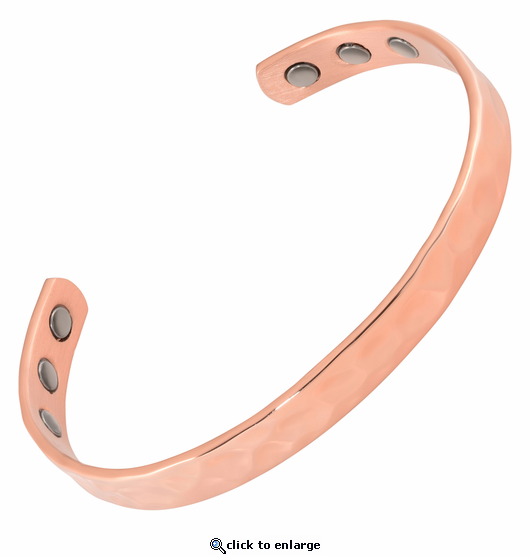 This gorgeous copper magnetic therapy bracelet merges the reputed healthful properties of two natural materials. The world's strongest kind of permanent magnets are combined in harmony with high quality copper, a metal treasured since ancient times for its heat conducting properties and therapeutic potential. Six powerful 3000 gauss neodymium rare earth magnets, north facing for the greatest effect, are set into a gleaming solid copper cuff. The fine craftsmanship of the artisanal hammered design brings out all the natural beauty of this nickel free copper magnetic bracelet. The picture does not do justice. A simple, casual but elegant style that can be worn by men and women, this bracelet is slim (about 1/3" width) and lightweight. It also has stainless steel magnet caps for added durability. Buy it to pamper yourself or as an impressive yet affordable gift.